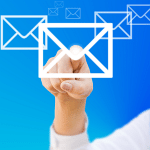 – you are using a 3rd party program or Outlook add-in. However, as you’ve probably noticed, using the above SendObject command triggers the Outlook security warning popup window. If you try to run the above VBA Macro and you receive an “invalid user type” error, please make sure you enabled the Outlook reference in VBA. To enable it, open VBA (Visual Basic Applications) with the Macro editor, then go to the Tools menu -> References -> mark the option to use “Microsoft Outlook 15.0 Object Library” (Outlook 15.0 means Outlook 2013, so you have to replace the Outlook 15.0 version number with the actual version number of your Outlook installation). If you don’t have access to the source code of the program that triggers the Outlook security warning, obviously the above method is not going to work for you. 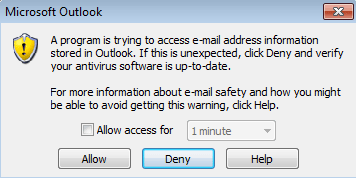 To solve it, you have to use a program designed to disable the Outlook security warning window. 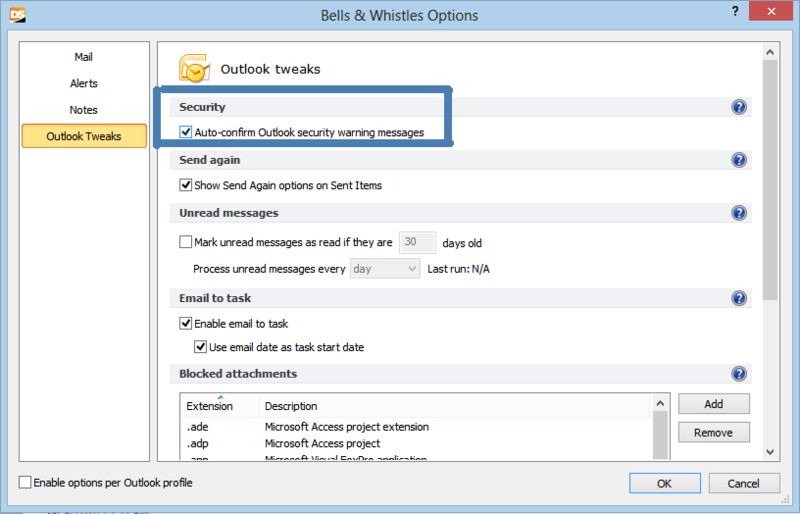 Meet Bells & Whistles for Outlook: among several other features, this Outlook add-in gives you the option to disable the Outlook security warning window. Simply install it, start Outlook, open the Bells & Whistles Options menu located on your Outlook toolbar area, go to the Outlook Tweaks tab and mark the option “Auto-confirm Outlook security warning messages”. That’s it! Bells & Whistles offers a free trial period, so you can install it and see if it solves your Outlook warnings issue, before actually paying for it. It works with Outlook 2003, Outlook 2007, Outlook 2010 and Outlook 2013 (x32 and 64 versions). We’ve also tested on Access 2013 with Windows 8 and Outlook doesn’t trigger the warning message… maybe there is another vba code section of yours that triggers the warning… that message is triggered not just if you try to send an email, but also if you try to load Contacts (or other functions considered sensitive by Outlook). But using sendmail() in combination with bells and whistles seems to cure it. Hi. This sendmail() code really helped me. However, I want to include an access report into the email.